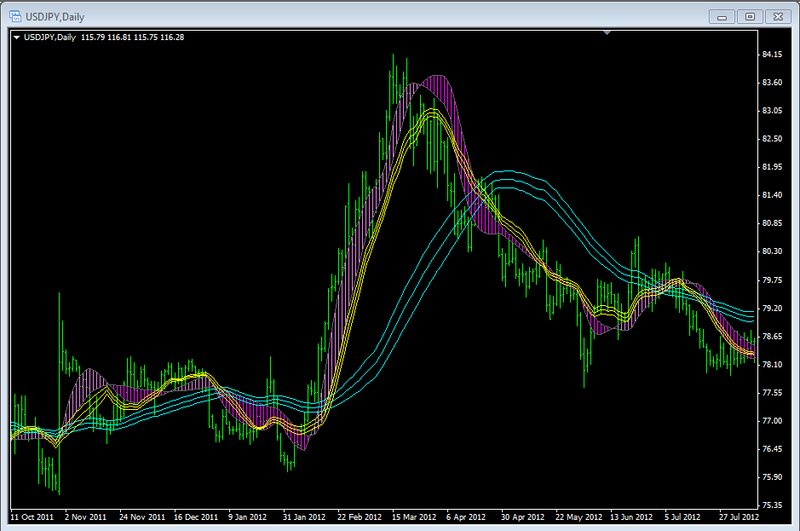 The Magic Bands trading strategy can be applied to daily or weekly charts as well as scalping charts. It needs only a minor change which is not completely necessary. 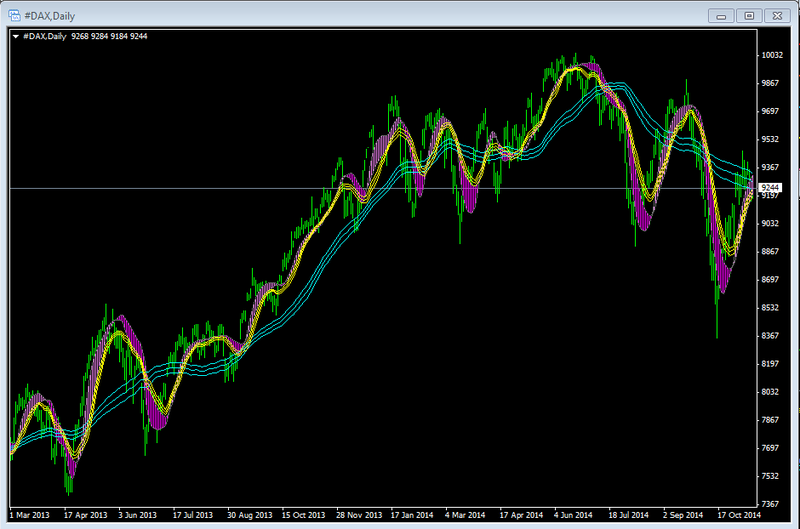 There is another indicator called the 'ribbon' which adds a bit of colour to the chart as well as denoting momentum. The ribbon expands as momentum builds and that may be useful for some traders as they inspect their charts to look for entries. The chart may also be enhanced by the Gator oscillator which shows the momentum, that is optional and is not necessary to use this trading system effectively. 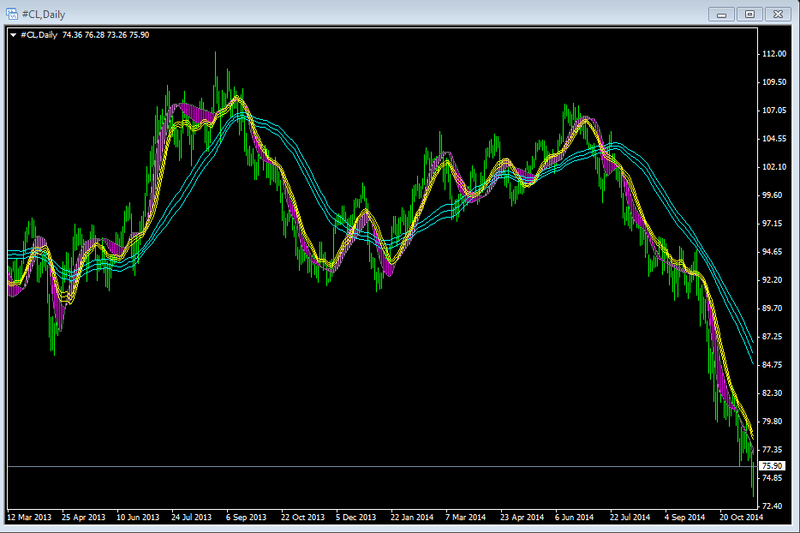 Of course, on a longer chart a person will want to include a trailing stop as the position may last for several days or weeks as shown in the USDJPY chart below. You can see that the long entry lasted for several weeks. Here is a chart of the Dax Index and on it you can see some great entries as that index has been climbing steadily for several months until this past summer. Once again this simple trading strategy has been able to bring significant profits with a minimum of maintenance to the portfolio. 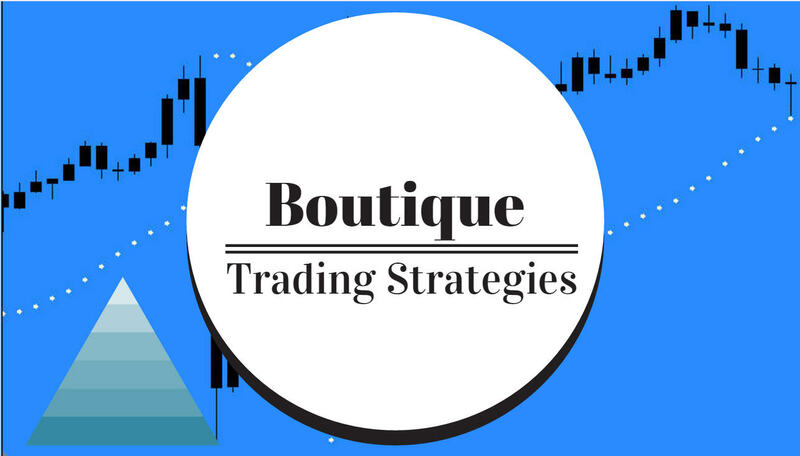 There are many Forex pairs and Stocks and Indexes that have long trends and are quite well suited to this trading strategy. It requires only a few minutes a day to review a sizable portfolio to do what ever maintenance and entries are required. To locate instruments that may be suitable for this type of system a person needs only do a scan for trending stocks or currency pairs and there are many to choose from. Probably those with some volatility would appeal to many investors. The indicator settings can be found on this page Magic Bands Scalp Trading Strategy along with some other information. One more chart that I have here for you to glance at is that of Sweet Light Crude, you can easily see that a trend following strategy would have reaped excellent profits in the past eighteen months. Be sure to use a trailing stop with this system as the markets are completely unpredictable.